Mochacino is a light brown taupe with loads of silver shimmer. I know think I have any taupes like this. Mochacino reminds me of milk chocolate or even a latte. I read somewhere it looks like it has been coated in sugar - and that's very accurate. 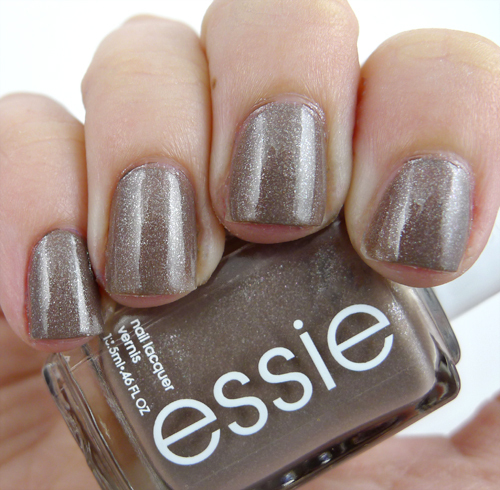 Most shimmers just have a small amount - this polish is loaded with silver shimmer. Application was beautiful - Essie's have a smaller brush but I like that sometimes because I can be more precise. I did three coats - but you could easily get away with two coats. Essie polishes retail for around $8, but some stores are selling Essie's for around $7.75. Mochacino is a retail exclusive, and can be found at retail stores such as Walgreen's, Target, and Walmart. You can find more awesome posts on squared nails blog! It looks like a goreous summery colour! !Like it!! Great color! remind me a little of Butter London All Hail McQueen, but still gorgeous!